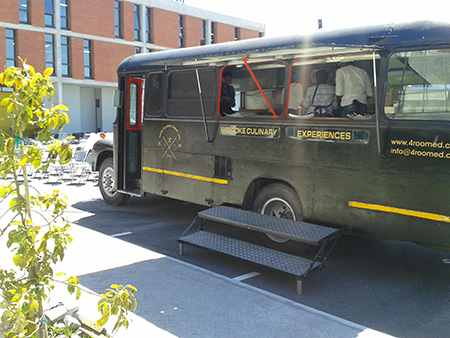 CAPE TOWN – An old school bus, painted black and refurbished as a top quality travelling kitchen, can be found parked outside popular township tshisanyamas delivering delicious healthy food as an alternative to plates full of braaied meat. The cleverly customised food bus is the brainchild of Khayelitsha-based entrepreneur Abigail Mbalo who, as the third-placed contestent in Master Chef SA 2014, is winning dedicated meat eaters over to more balanced plates of food, one delicious serving at a time. Mbalo, who was a dental technologist at the Cape University of Technology (CPUT) when she kitted out her bus and started her food and vintage business called 4Roomed eKasi Culture in 2014, said she had first hand experience of the negative consequences of the diet of bread and meat diet consumed by many township residents. ‘‘My aim is to give people access to a balanced plate of food that will make their lives better,” said Mbalo. She said 4Roomed eKasi Culture is based on the concept of the four rooms that comprised the typical township dwelling in which she grew up in Gugulethu. Initially, she operated her food bus only on weekends, as she still worked fulltime at CPUT. But she quit her job when she saw how successful her food business became. Besides serving delicious, nutritious food from the bus, she has a pop-up restaurant at her house decorated with vintage items and furniture. She also sets the pop-up restaurant up outside her bus, which, besides serving outside tshisanyama venues, is available for functions and markets. To supplement her supply, she grows herbs and vegetables in her back yard and besides making affordable fine food available in the township dominated by meat and fast food outlets, she employs up to four young people who she calls on when she is commissioned to cater for an event.